When you have gone to a lot of effort to have a spectacular wedding cake, the last thing you want is a cake stand that will compete for attention or not safely support the cake. This stylish cake stand has been specially designed with a wide stable base which will hold your celebration cake without toppling. It’s contemporary understated design will enhance rather than detract from your cake. 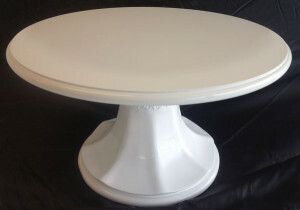 The Just Desserts cake stand can be hired for just $50 plus bond. Pick it up from the Just Desserts’ showroom on a Friday afternoon before your weekend event, and return on the following Monday. 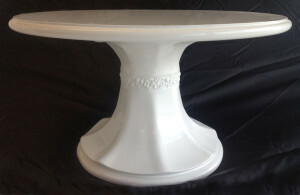 The cake pedestal display stand is also available for events during the working week. Call us on (03) 379 3754 to enquire about booking the Just Desserts cake stand. Call us on (03) 379 3754 to enquire about pedestal cake stand hire.